Buy through MusicWeb £29.00/30.00/31.60 postage paid. The Australian composer Brenton Broadstock was born in Melbourne. Apart from studying at Monash he has also pursued other musical studies with Donald Freund (Memphis State) and Peter Sculthorpe (Sydney). Prizes and commissions have deservedly come his way. Currently he is a professor at the Faculty of Music at Melbourne University. His music however is most unprofessorly as the five symphonies in this set issued some seven years ago amply demonstrate. Broadstock does not place elitist obstacles between himself and the listener. His music speaks direct from the heart to the heart. The First Symphony appropriates its title from Bunyan's Pilgrim's Progress. It is dedicated to Broadstock's son, Matthew. It charts the father's gradual realisation that Matthew was severely handicapped and the acceptance but not understanding of his condition. The music moves through ecstatic tonal realms related to the orchestral-pastoral music of Herbert Howells, through moments of Tippett-like lyrical aspiration to whoopingly uproarious tempests to a glowing resolution in an optimistic B major. Then follows a return to the long benediction of the horn writing that opens the work. This epiphany seems, and should seem, hard won. Along the way I recognised Broadstock's anger as a cousin to the same emotion that explodes in the symphonies of Malcolm Arnold. The Second Symphony is dedicated to fellow Australian composer Barry Conyngham. This is a single movement piece of about the same duration as its predecessor. Here it is laid out in five tracks. The tense buzzing writing for strings and brass recalls the Sibelius Sixth Symphony but is more volcanically volatile. The music grumbles and brays in squat rasping terms. The title is taken from the title of a collection of Ivor Gurney's letters and reflects the many aspects of light in darkness: the parallels with schizophrenia and the tension in all of us between the negative and the positive. Forbidding assaults of sound contrast with the whispered starry twinkling benediction we know from the works of Urmis Sisask and - up to a point - in Valentin Silvestrov. The blessing in tracks 8 and 9 is transient though substantial, leaving the listener with a sense of the positive. The close (tr. 10) blazes, growls and howls with much barkingly abrasive work for the brass and the insistent tattoo of percussion. This is kinetically exuberant music which has its own excitement and drama. It parallels but with a certain roiling bleakness that of William Schuman at his most supercharged. If you enjoy Schuman's Third Symphony and Violin Concerto you should track this work down. The ABC-commissioned Third Symphony is dedicated to his parents. It's in two movements each of which is here allocated two tracks. The work is a powerful expression of the feelings produced by watching Second World War Holocaust footage of Nazi execution squads murdering Jews. Then it sings an elegy for the Tasmanian aborigines who were systematically slaughtered by the white incomers. 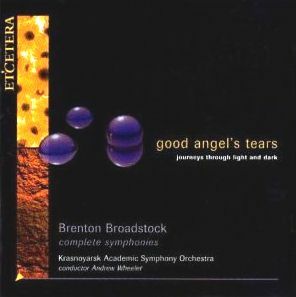 Like Broadstock's other symphonies this cannot escape the quality of blinding light with which he imbues the music but neither does he in any way tone down the barrages and gunshot impacts. All of these are stunningly and even forbiddingly caught by the gripping recording. Even in tempest the tiers and strata of the music remain lucid with the effect similar to the wilder reaches of Ligeti’s Le Grand Macabre and of Terteryan's eruptions in his Seventh and Eighth symphonies. There are a few Penderecki-style wails too but usually carried by the brass. The lava slides of the trombones and horns at the end of the first movement fleetingly recall Messiaen. The second movement has some of the elegiac ecstatic pastoral sense of the First Symphony. The idiom is the orchestral Howells of the 1920s and 1930s but with a modern edge. One soon gets to notice Broadstock fingerprints after listening to these symphonies and one of them is the eloquent oratory given to the brass instruments. The Third Symphony is a deeply impressive and moving work. The Fourth Symphony is, as the notes by Dr Linda Kouvaras claim, the most consistently gentle, transcendental and reflective of these works. The exalted utopian nobility of this music recalls the psychedelic transcendentalism of Valentin Silvestrov's Fifth Symphony yet Broadstock retains that lucidity of texture which in the Russian composer can congeal. The pulse is steady, slowly singing, evolutionary carried by confiding Sibelian violins with lines spun over, above and through by brass, percussion, harp and woodwind. The music radiates the air of a yearningly expressive benediction with the piano discreetly touching in a timeless pulse in tr. 2, 1:12 (CD2). That pulse is inexorable. The golden belling horns carry the theme to heights of grandeur and thunderous towering exaltation at the end of the first movement and at the start of the very short (2.48) second movement. The last work in this set is the longest: Broadstock's Fifth Symphony. Again it's in two movements with each movement, in this case, in four tracks. The title comes from Mark Twain who wrote that "everyone is a moon and has a dark side that he never shows to anyone". It was commissioned by Andrew Wheeler and the Krasnoyarsk orchestra. It is, it seems, the most autobiographical of his works. Here it is worth reminding ourselves that the dark side here referred to does not connote anything sinister: it is a reference to our inner self - our island of existence. The music moves through many episodes and early on (tr. 4) we encounter the same sense of confiding quiet eloquence with which the Fourth Symphony is rife. It quickly rises in tr. 5 to a superheated eloquence lofted high by trumpets and the brass choir. The buzzing Sibelian Luonnotar confidences of the violins (tr. 6 and later tr. 8 at the start and in the final drawing of breath in tr. 11) resolve into a balmy glowing lyricism close to Mahler's Adagietto but purer and without that layer of sentimental excess. This is a stunning golden work boiling a sense of kindly exaltation with a blazing kinetic forward pulse, hammered and sprinting. After hearing what Wheeler and Broadstock achieved over nine days of recording sessions with this otherwise unknown orchestra other composers should be beating their way to Krasnoyarsk. Broadstock is a doughty orchestrator whose skills are matched by his roistering volcanic confidence. This set represents a magnificent vividly living achievement which I urge you to hear. Petition your local orchestra to put on any one of these symphonies and make the first one to be tackled the Fourth Symphony.